Hello i am Elizabeth. I’m a 15-year-old girl going to highschool. My little sister Isabella is 14 still with imaginary friends. She says they are real and they only understand her. She goes to doctor’s appointments about this. She argues with our elders and talks to herself saying she is talking to her friends. One she frequently talks about is Deadly Roses. She says she is a tall lady with twins as her children and is a happy mother with her lover. She also says she lives in the forest with little kid’s spirits. She supposedly watches over the forest and when she is angry she kills humans with her poisonous vines. It worries me with my sister having “friends” like this. I think she got so depressed of not having real friends she locked herself in her little mind with these imaginary creatures. One night i woke up to the noise of walking downstairs. I got up and quickly got dressed walking down the stairs to follow. I saw Isabella in a black dress with a blood-red rose in her hair and she was following a tall black figure. I followed along with the two heading towards the forest. After a while of walking I saw my sister take the hand of the figure and the two disappeared in a cloud of smoke. I ran to where they disappeared yelling out Isabella’s name. I ran deeper into the woods yelling out my sister’s name and then I saw her. She was standing there in the outfit and I ran towards her when the figure appeared. I backed away startled as the figure said in her distorted and demonic voice “such a pure rose crumpled” and my vision went blurred. 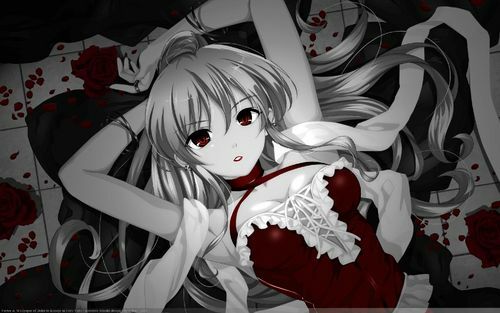 I passed out waking up the next morning in my bed with Isabella standing at the doorway with a devilish grin with the same blood-red rose in her hair and her nails painted black. That was nice, I was intrigued.